Please let me know the stone choices from left to right (up to 5 each row) AND top to bottom. Please refer to the photos as a guideline for the stones I offer. 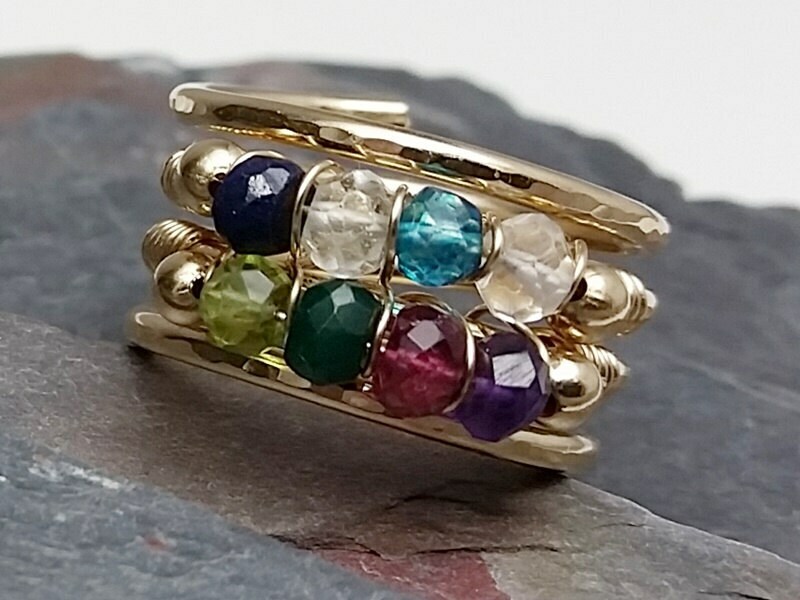 Made your choice of Sterling Silver, 14K gold Filled, or 14K Rose Gold Filled wire, hammered for sparkle and shine, this ring is a showstopper with your selection of gemstones. You can choose up to 10 birthstones, up to 5 on each row for this piece. If you need more stones, please contact me. Solid Gold pieces will not have gold beads on the sides. PLEASE NOTE: This ring is wide and if your fingers are short it may not be comfortable on them. I recommend sizing your finger for a wider ring at a jewelry store before purchase. This can be done free. Please be sure the size is correct as this is considered a custom piece and as such is non returnable. Please allow a few days for creation of this ring, I then ship first class via USPS. This ring will come insured by me.